The new Moto 360 and Gear S2 are new and improved, but are they a match for each other? 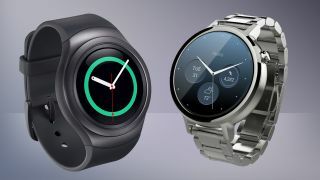 Motorola and Samsung have both made waves in the wearable industry this year, with Motorola releasing the follow up to its popular Moto 360 and Samsung completely overhauling the Gear S to look more like a traditional, round watch. While each device has a lot to offer, most aren't looking to have two smartwatches. So it begs the question - which device is better? We took a look at the 2015 version of the Moto 360 and put it up against the highly praised new Samsung Gear S2 to see which smartwatch you should buy. Because smartwatches are worn in plain sight, design tends to be an important consideration, especially for the more fashion-conscious. Motorola hasn't overhauled the design of the Moto 360, however it has made some subtle changes. Perhaps the most important change is that the watch now comes in three sizes: a 46mm (1.81 inch) body with a 22mm (0.87 inch) strap, a 42mm (1.65 inch) body with a 20mm (0.79 inch) strap, or a 42mm (1.65 inch) body with a 16mm (0.63 inch) strap. Motorola is billing the first two as made for men and the third for women, however women with larger wrists could consider a larger device, as men with smaller wrists could consider the smaller device. Apart from size, the crown of the Moto 360 (2015) has moved to 2 o'clock rather than 3 o'clock, and the body now features stylish lugs on the top and bottom for holding onto the strap. And speaking of the strap, users have an even larger range to choose from, including metal options. The body comes in either gold, black or silver. As was the case last year, customers can create their ideal Moto 360 using Motorola's Moto Maker. As mentioned, when it comes to the Gear S2, Samsung has completely overhauled its look. It's now round and looks like a watch rather than a mini smartphone strapped to the wrist. The standard Gear S2 looks more like a sports-oriented device when put up against the Moto 360, which looks a little more classic, however the simplistic and industrial design of the Gear S2 shows that it certainly wouldn't look bad with a suit and tie. The Gear S2 also features two buttons on the side, one at 2 o'clock and one at 4 o'clock. It comes with either a black or white plastic band, with the body available in a polished black or standard chrome look. Interestingly enough, both the Gear S2 and Moto 360 come in at 11.4mm (0.45 inches) thick. Overall, both smartwatches are very well designed. It comes down to taste: the Motorola watch looks classier while Samsung's smart timepiece has a sportier flare. After all the criticism surrounding the flat-tire display of the original Moto 360, you'd think some changes would be made to offer use of the full screen. Unfortunately, Motorola hasn't been able to do this, and has kept the display as-is. Depending on the Moto 360 (2015) model you get, the display is either 1.56 inches (39.6mm) with a resolution of 360 x 330 pixels and a density of 233 ppi, or 1.37 inches (34.8mm) with a resolution of 360 x 325 pixels and a density of 263 ppi. When it comes to the Gear S2, the display is smaller than either version of the Moto 360, coming in at 1.2 inches. However, the display has a better resolution at 360 x 360 pixels. It's also is more crisp with a density of 302 ppi. It's really a tie here. Those who want a larger display - and considering a smartwatch display is already pretty small - should go for the Moto 360. Those who prefer display quality rather than pixel quantity should instead opt for the Samsung device. While the flat-tire may not be pleasing to the eye, it stayed on the latest Moto 360 to offer more space for everything happening under the hood. As far as processing goes, the Moto 360 (2015) makes use of a Qualcomm Snapdragon 400 processor, a quad-core running at 1.2GHz. The Gear S2 takes it a little slower: its processor is a dual-core Samsung-built Exynos 3250 that runs at 1GHz. While the Motorola watch has Samsung beat when it comes to processing, the two smartwatches tie in the RAM and storage department, featuring 512MB of RAM and 4GB of storage each. Remember when we said that the Gear S2 looks sportier than the Moto 360? Well, it turns out it isn't just looks: the Gear S2 makes full use of Samsung's S Health app. It will recognize when the user is walking and will start tracking movement immediately, so users don't necessarily have to remember to start tracking. It will do the same for running and biking. Apart from that, the device also features health tracking sensors like an accelerometer, gyroscope, barometer, ambient light monitor, and heart rate monitor. As far as the Moto 360 goes, on the software side it sticks pretty close to any other Android Wear watch. It includes many of the same sensors as the Samsung watch, including the heart rate monitor, but it's slightly lacking on the software side. One feature that's important to consider is a watch's water and dust rating, which could definitely help for those into activities like swimming. The Gear S2 once again has the Moto 360 beat, with a rating of IP68, meaning that it can be submerged in water for long periods of time, while the Moto 360 features an IP67 rating, meaning it can be submerged in 1 meter (3.3 feet) of water for up to 30 minutes. The Moto 360 (2015) wins in all cases in terms of battery capacity, with the 46mm and the 42mm models beating out the Samsung Gear S2. The 46mm version has a 400mAh battery, while the 42mm owns a 300mAh juicer. However, according to manufacturer-estimated battery lives, the Samsung watch offers a longer battery life. This is likely due to how the software handles battery, combined with the fact that the Gear S2 features a smaller display. According to Motorola, the 46mm Moto 360 will last two days and the 42mm model will last a day and a half. Samsung says its watch will last between two and three days. Motorola has worked closely with Google in the past few years, a relationship that shouldn't come as a surprise since Google owned Motorola for a while. As such, the Moto 360 runs Google's Android Wear operating system and is compatible with any Android smartphone running 4.3 or later that has Bluetooth connectivity. Compatibility doesn't end with Android, though, as users can also pair their device with an iPhone running iOS 8.2 or later. The Gear S2 is compatible with fewer devices, however it still has a wide range of compatibility, which is surprising considering it's running Tizen, Samsung's proprietary operating system. The device is compatible with Android devices running 4.4 and higher. Those firmly wanting to remain in the Android ecosystem or who own an iPhone should stick to the Moto 360. However, despite running Tizen, the Gear S2 also offers compatibility with a wide range of devices. The Moto 360 will set users back $299 (£229, AU$329) which is the same as the Gear S2's pricing of $299 (£249, around AU$428) though the cost varies internationally. Of course, Moto 360 users can customize their watch with various band and size options, in which case it might cost more for a personalized device. The Samsung Gear S2 and the Motorola Moto 360 are both great smartwatches that have clearly surpassed the first generation of devices. While you really can't go wrong with either of them, there are some key differences that might make one a more appropriate device for a particular user. As mentioned, the more fitness-aware would probably be better suited with the Gear S2, while the more fashion conscious are likely going to lean towards the second-generation Moto 360. Apart from those two distinctions, the new Moto 360 and the Gear S2 really are neck-and-neck and should satisfy anyone looking for a next-gen smartwatch.